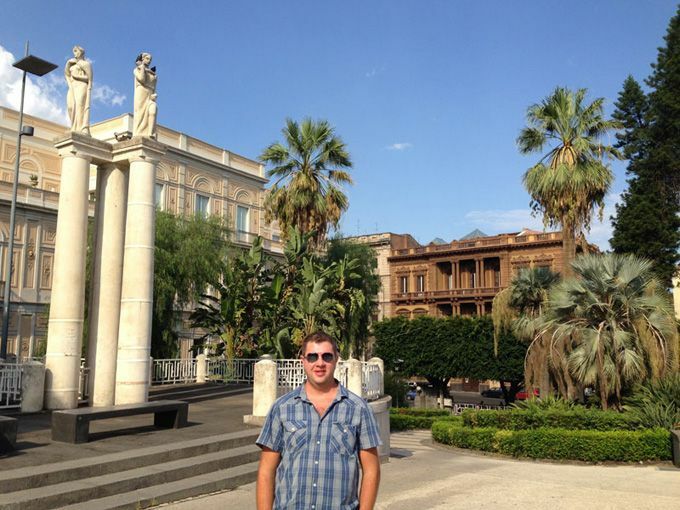 It was mid-September 2014, my wife and me decided to travel to Catania; Sicily, Italy to enjoy warm weather in autumn and great Italian food as well as to celebrate my wife’s birthday. Before travelling, I got some travel advice from Italy specialist in Turkey; Intra Tours CEO Ertugrul Karaoglu about where to go, what to see and where to eat. We prefer to stay in an apartment instead of a hotel so that we can shop from Catania’s famous markets and try food at home. I booked an apartment thru Airbnb. Before days to our flight, Ivano sent us details about his apartment as well as Catania and also asked if we have any special requests. He arranged us a transfer from airport to the apartment. The driver who picked us at airport is very friendly and hospitable. If you plan to go to Catania and didn’t book a place yet, you should check out this well decorated and good location apartment in the heart of Catania. Here is a list of hotels that you can stay in Catania. Catania that has a history dating back 2700 years dominated by several different cultures (Greeks, Romans, Arabs, Normans, Spanish, etc.). The city, which is located on the eastern coast of Sicily at the foot of Mount Etna, the biggest volcano in Europe, is a World Heritage Site. 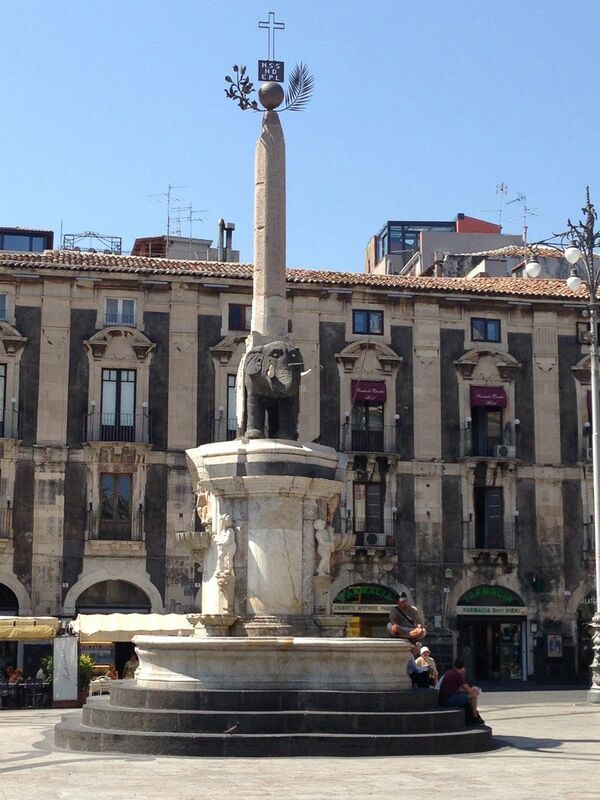 It is the second largest city in Sicily with the metropolitan area reaching one million inhabitants. The city has been destroyed many times in the past. The major two feature of this city are its architecture and food. Catania is well known for its particular baroque architecture. In Italy the Baroque period began late in the 1500s. In Sicily, however, it was introduced later. The term itself may derive from the Portuguese word barroco for an irregularly-shaped pearl, an obvious reference to the ornate sculptural motifs typical of Baroque architecture. Following the great earthquake of 1693, new street plans were developed and a number of churches and palaces were built in a novel "Sicilian Baroque" style. The major characteristic of Baroque architectural is its theatricality and you will be able to see many examples of this Baroque architecture at the old 17th century downtown area which is still the center of the day-to-day life. You can feel a mix of nostalgia and "joie de vivre", especially at night or during festivals in Catania. You should definitely see two fascinating markets that are held almost every morning except Sundays. One of them is a large open fish market in a beautiful setting off Piazza del Duomo and other one is a bustling food and clothes market off Via Etnea. While you are around Piazza del Duomo, you should not miss to see the adjacent Norman Cathedral and the Elephant Fountain which is from the 17th century. All the historic district is very interesting, however do not miss Via Crociferi, piazza del Duomo, the fish market (la pescheria), Teatro Massimo, Ursino Castle and "Monastero dei Benedettini" (if you have time, take a guided tour of the monastery. The tour it is organized by students - literature and philosophy faculty are located inside - and with a contribution of few euros they will take you around to visit the monastery). If you like art, I suggest you visit Palazzo Platamone (via Vittorio Emanuele) and the foundation located in front of... There are always very interesting expositions of contemporary art. 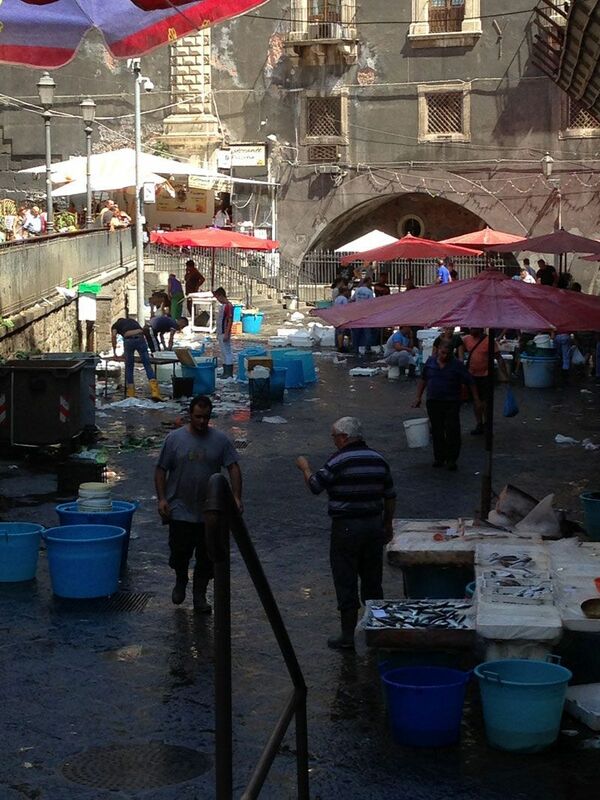 Last, if the weather is nice, I suggest you to visit San Giovanni Li Cuti, old marina on the Catania waterfront. 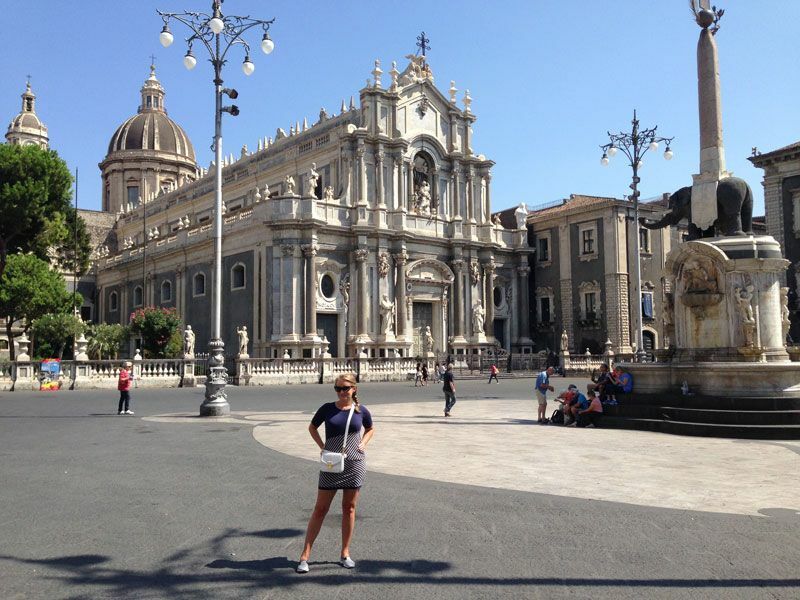 If you want guided tours, visit this page and find a list of sightseeing tours in and around Catania. Both food and wine are also among main attractions, and you may have sampled something of both long before arriving the city. What you should taste? Caponata, a tasty salad made with eggplant (aubergines), olives, capers and celery, makes a great appetizer. Panella, a thin paste made of crushed or powdered ceci (garbanzo) beans and served fried. Arancine, fried rice balls stuffed with meat or cheese. If you want to taste traditional "arancine", just stop by Bar Savia, (on the corner between via Umberto and via Etnea)…the best arancine in town. Grilled swordfish, smaller fishes; especially snapper and sardines, seppia (cuttlefish) which is served in its own black sauce with pasta. 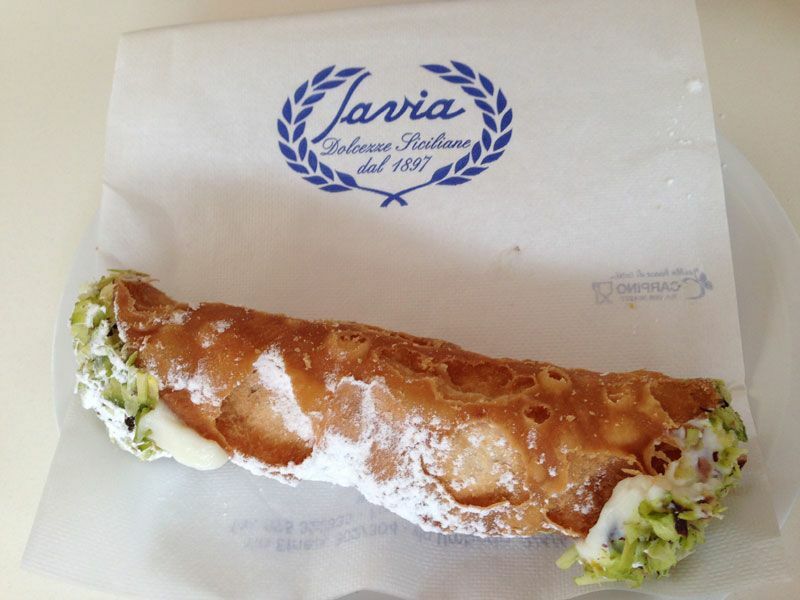 As dessert, you must try Cannoli, tubular crusts with creamy ricotta. Some places also offer with chocolate filling. see photo above, you can order same one at Pasticceria Savia located on Via Etnea just opposite to the entrance of Giardino Bellini Park. Sicilian Granita. May is the beginning of granita season. The Italian word granita is often translated “frozen ice”. It consists of thin flakes of ice flavored with fresh fruit and sugared. 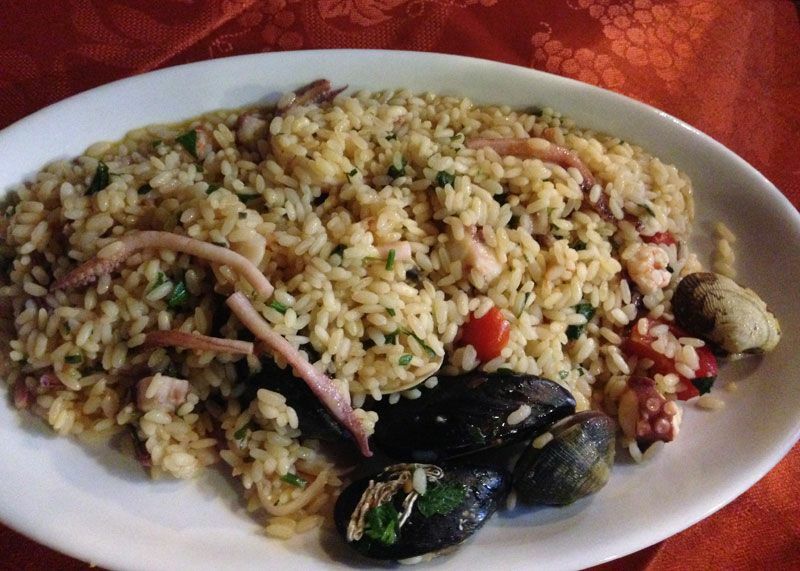 In Sicily the luncheon hour starts around 1:00 PM, and dinner is usually served from around 8:00. Many restaurants are closed Mondays, and trattorias, less formal restaurants which don't always serve evening meals, are usually closed Sundays. Pizzerias usually serve dinner but not lunch. Ristorante - a rather formal restaurant; expect uniformed waiters and a good but pricey menu. Trattoria - a less formal restaurant, though a trattoria meal can cost as much as one in a ristorante. Osteria - a small restaurant, in theory less formal than a trattoria and less expensive, offering a limited menu. Pizzeria - a restaurant specialized in a wide selection of pizzas; typically open only in evenings, some pizzerias serve pasta. Polleria - a stand or small shop that serves chicken on a skewer, usually as a take-away food. Rosticceria - a stand that sells arancine (rice balls), french fries and other fried "street food." Gelateria - an ice cream parlor, which also serves various drinks. Pasticceria - a pastry shop, which may also serve ice cream. Here are some addresses you may try. Osteria Ristorante Pizzeria Antica Sicilia, located Via Roccaforte, 15-17, Catania. Antica Marina (at the fish market, fish cuisine). Need to book in advance. Most of the nightlife is centered around the Piazza Bellina and the surrounding streets. Usually there are more people drinking on the streets than inside the bars. Sicily's most famous wine is Marsala. Marsala is often divided into three different standards, namely oro (golden), ambra (amber), and rubino (ruby). You may try in many trattorias in the city. If you plan to visit near Catania and want to drive there are many rent a car companies. If you are on budget you may try Auto Europa. Within a day, you can easily reach Taormina, Syracuse, Ragusa, Piazza Armerina, Messina, Cefalu or Etna. Acicastello and Acitrezza, small villages of fisherman - 6km from Catania (city bus n. 534). Etna, an eerie volcanic landscape, with solidified "rivers" of lava. The top is 3,323 m high, so be prepared for the cold, even in summer. There are some tour companies that make a tour to Mount Etna.